Five deaths have been confirmed and multiple people have been injured in the Thursday shooting at The Capital Gazette newspaper office in Annapolis, Maryland. Joel McCord has been at the scene and told Morning Edition host Nathan Sterner what he's learning about the incident. 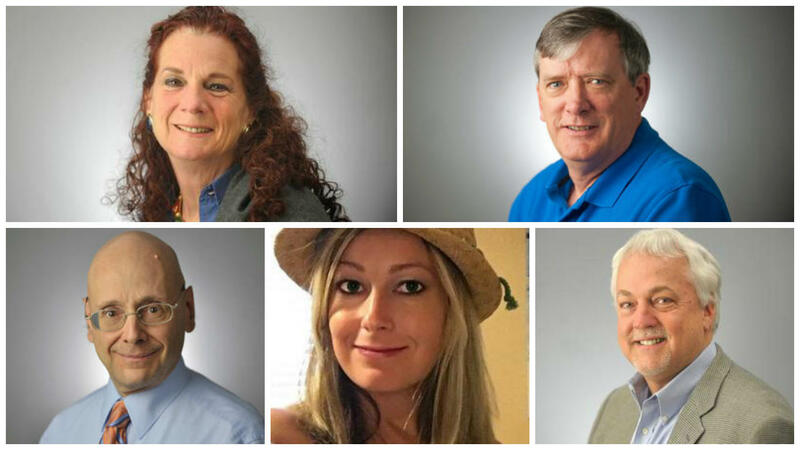 Pictured from top left: Wendi Winters, John McNamara, Gerald Fischman, Rebecca Smith, and Rob Hiaasen. Winters, McNamara, Fischman and Hiaasen wrote for the paper, and Smith was a sales assistant. You can read about them and their work here. The shooter has been identified as 38-year-old Jarrod Ramos of Laurel, Maryland. He is facing 5 counts of first-degree murder and his bail hearing was scheduled for Friday at 10:30 a.m. in Annapolis. A 2011 column in the paper reported on his harassment of a woman on social media. Ramos sued the paper for defamation in 2012 but the suit was dimissed. Lt. Ryan Frashure, the Anne Arundel County Police Department spokesman said "It was apparent that this individual had a vendetta against The Capital newspaper and they were specifically targeted." The attacker threatened the paper on social media as recently as Thursday. Ramos was captured in the building that houses The Capital Gazette offices shortly after the shooting started. The suspect entered the building with a shotgun and looked for his victims as he walked through the lower level. The suspect entered the building with a canister of smoke grenades. 170 people were evacuated out of the building located at 888 Bestgate Road. Several businesses are located inside the property. Police say the building will be secured for some time. WYPR's Dominique Maria Bonessi spoke with some of the evacuees. The Anne Arundel County Police Department has set up a phone line for family and friends seeking information regarding the incident at 410-768-5522. Anne Arundel County Police say they evacuated 170 people yesterday from the building in Annapolis that houses the Capital Gazette newspapers and other offices. Here are a few of the stories of the survivors. ANNAPOLIS, Md. (AP) — Multiple people were shot Thursday at a newspaper in Annapolis, Maryland, with a witness saying a single gunman fired into the newsroom. A reporter at The Capital Gazette tweeted that a single individual shot multiple people. Phil Davis, who covers business and politics for the newspaper, tweeted that the gunman shot through the glass door to the office and opened fire on multiple employees.